The Armstrong Atlantic State University Department of Art, Music & Theatre’s (Armstrong AMT) Masquers theatre troupe reprises its Summer presentation of Company of Wayward Saints, George Herman’s comic tale of wandering players who, while performing a slapstick history of man themselves, discover the comedy and grace of the human condition. For two evenings only, 7:30 p.m. on Friday and Saturday, August 23-24 in Armstrong’s Jenkins Hall Theater, the troupe ushers in the University’s Fall Semester performance schedule with Herman’s commedia dell’ arte-inspired piece. 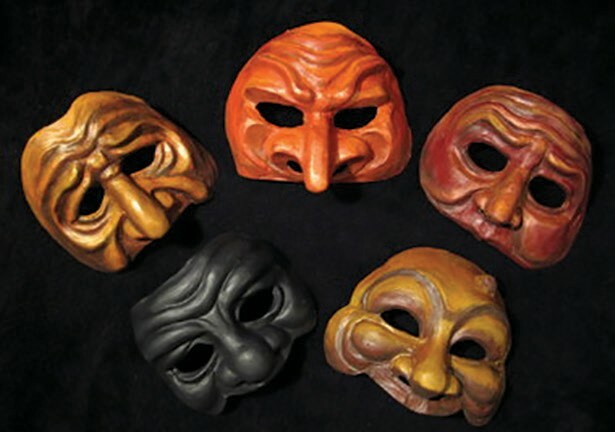 Commedia a 16th century Italian art form, is a genre of comedy that was performed by traveling artisan theatre troupes. Commedia features much improvisation, physical action, common storylines, distorted masks, extraordinary costumes and a cadre of stock characters perhaps the best known of all being Harlequin. NEW! The Masquers introduce reserved seating for its main-stage performances this season. Regular reserved-seating admission tickets to Company Of Wayward Saints are only $10 and are available at tickets. armstrong.edu, by visiting Armstrong Fine Arts Hall during box office hours at 912.344.2801. Performances begin at 7:30 p.m. Please be seated by 7:15 p.m.
For more information, visit tickets.armstrong.edu or call the Fine Arts Box Office at 912-344-2801. Box Office hours are noon to 3 p.m., weekdays. There are no daytime box office hours on Saturdays. On performance dates, any remaining seats will be sold at the door beginning one-hour before start time. Call 912.344.2801 from noon to 3 p.m., weekdays, for information.